Static cling labels are the reusable vinyl labels that can be custom die-cut to any shape for product promotions and branding. The greatest advantage of these labels is that they can be easily removed and repositioned without leaving sticky residue mess on the surface. Perfect for glass, metal, windows, mirror surfaces, and some plastics, these labels can be custom printed with company information, logo, contact number or other details. 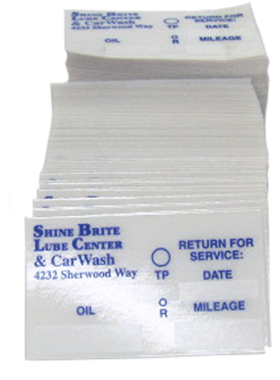 At Performance Label Company (PLC), we offer fully customizable static cling labels (white or clear) that adhere to most of the clean and smooth surfaces. These labels are highly sought-after for a wide range of indoor or outdoor promotional applications. Can be Wiped Clean : The labels not only offer clarity and perfect visibility, but also they can be easily wiped clean, if not required. Also, this cleaning can be done using water and non-abrasive detergent. Resistance to UV Rays : PLC’s static cling labels can be used outdoors, and they won’t fade or show signs of yellowing for a long period. Since these labels are resistant to UV rays, they are largely chosen for endless outdoor applications. Save for Later : These labels can be removed and reapplied over and over again without leaving mess on the surface. This makes it easily store the label when not in use for future applications. As they are designed see through, they will not obstruct the view outside your way. The labels allow printing the messages tailored to your needs. Available in many shapes and sizes, they retain their ‘cling’ for more than a year, or two. They can be printed with high color graphics, ink colors and brilliant fade-resistant colors. At PLC, we guarantee to provide unparalleled quality in all the product offering and superior customer service. We possess the technology, experience, and the right people to bring you adhesive-free and easy-to-apply static cling labels that are delivered on time, all the time, at highly competitive prices.